TROFEO RANKING NACIONAL CLASE A CAR “INFANTA CRISTINA” MAR MENOR - 20 Boats present for the first European event of the year. Manuel Calavia dominated the event 5 bullets. 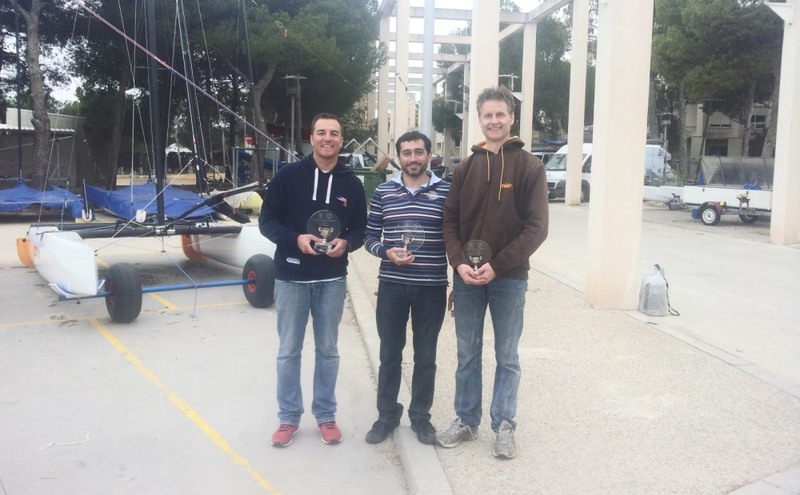 "Last weekend we held the first regatta of the Spanish A Class Circuit in La Manga del Mar Menor, the place where the Europeans 2007 were held. My main goal with this regatta wat to test the new DNA dagger boards against other boats with normal curved boards. Some Dutch guys came to this event. We did 6 races in two days. 4 races in Saturday with winds from 4 to 10 knots and 2 races on Sunday with winds from 12 to 15 knots. On Saturday I did 1-2-1-2 with the new DNA 2013 (J boards / rudder winglets) and José A. López did 2-4-3-1 with the new Flyer from Egner. As always José is very fast in light conditions. The races 2 and 3 where with 7 to 10 knots and the races 1 and 4 with winds from 4 to 6 knots. On terms of performance I not feel any difference between the DNA 2013 and the DNA 2012 in these light conditions. On Sunday I did 1-1 and Micky Todd did 2-2 with the Sheurer G6. Micky sailed very well and had a very good performance with his own sail. On terms of performance, my feeling is that in these conditions of the wind with the J boards the boat is faster and deeper in downwind. In upwind the performance was the same. I think the big difference is that the feeling of flying is there and the boat is more easy to steer with J boards and consequently you can sail faster and deeper in downwind trapeze style"